Nuby Toothbrush Massager with Protective Case | Pink | Unique texture design provide your little one soothing and comfort little gums. Designed to relieve your little one's gums of soreness and soothe them, this toothbrush massager is a must-have. The brush is easy to grip while using and comes with a protective case to keep it clean. 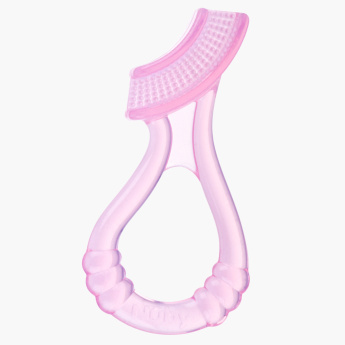 Feature 2 : Easy to hold for your baby little hand with super soft silicone handle. Feature 1 : Unique texture design provide your little one soothing and comfort little gums. Feature 3 : Comes with protective case for preventing and dust and germs.